Please join us in welcoming Lorraine Mace, aka Frances di Plino, to the Displaced Nation for the first time. From this month, she’ll be taking over the Location, Locution column from JJ Marsh. Hello, Displaced Nationers! I am thrilled to be taking over this column from JJ Marsh, and I already have lots of interesting guests lined up to take part over the coming months. 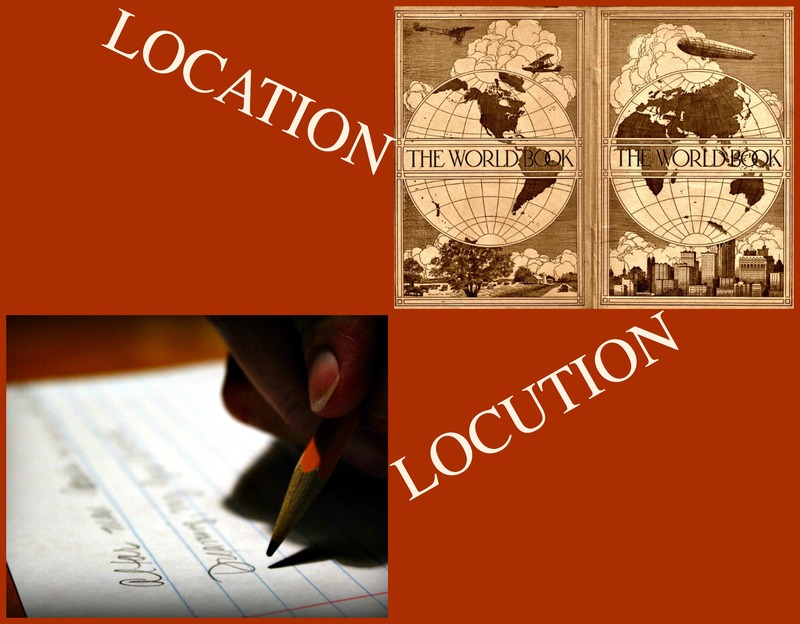 For this first post, however, I am going to follow in Jill’s footsteps and use my first column to answer the “location locution” questions as a means of introducing myself. But before I do that, let me give you a few basics. I was born and raised in London, but moved to South Africa just before my 25th birthday. I first lived just outside Johannesburg, then moved to the Orange Free State before discovering, and falling in love with, “the fairest cape”. Since leaving Cape Town I’ve been a nomad for more years than I care to count, having moved continent and country nine times. I finally put down roots in Spain, but have an inclination to spend summers in British Columbia, Canada. Like JJ, I write crime fiction. I also have a book series for children. The prolific Lorraine Mace has produced four books in her D.I. Paolo Storey crime thriller series, and one book in her Vlad the Inhaler series (vampires, werewolves and peaches, oh my!). Oh, and one last item before I move to the questions: don’t forget to visit my predecessor’s farewell post and enter the book giveaway competition. So far there’s only two comments, which by my reckoning gives you a pretty good chance at winning seven great e-books! This can vary from book to book and story to story. However, in my crime novels, written as Frances di Plino, story came first—but then location helps to formulate the plots. Although the series is set in a fictional town, the surrounding British countryside is very real. Bradchester is situated close to Rutland Water and the nearest city is Leicester, both of which feature in the novels on a regular basis. I know this area well. During my last (brief) sojourn in England I lived in a small village a stone’s throw from Rutland Water and frequently visited Leicester. I put myself into the heads of my characters and experience the place through their senses. When I can smell the bread in the local bakery, or hear the cries of street vendors, weep over a beautiful sunset, taste an orange straight from the tree, or touch the moss-covered stones of a monastery, I know it’s time to start writing, using my character’s experiences of the place. All three, but I must admit I find it easier to use food allied to culture when the story is set outside of the British Isles. Having lived in South Africa, on the Maltese island of Gozo, as well as in France and Spain, I know I can use regional dishes to bring areas of those countries to life. But in Britain I think we have lost the regional aspect of many of our foods. Fish and chips, roast beef and so on are now available throughout the country, where other nations seem to have guarded their regional food identities. Bradchester is a town that has more than its fair share of rundown, seedy areas set side by side with gentrified neighbourhoods. This leads to a great deal of social unrest—the haves want the have-nots moved elsewhere and the have-nots resent the wealth and easy life of the haves. This short passage illustrates an area that has, as yet, remained untouched by either sector, but just a street away it is very different. Station Road wasn’t exactly the best part of town, but the place looked respectable. Paolo was pleased to see that most of the businesses he remembered from his youth were thriving. This was one of the few communities that still had a drycleaners, newsagent, old-fashioned fruit and veg shop, alongside a mini-supermarket, hairdressers and a bank. He glanced up. Even the flats above the businesses looked lived in and cared for. Nice nets and curtains framed the windows and many of the street doors had been painted in recent history. They walked a couple of hundred yards before turning into Zephyr Road. It was like moving into another country. Here, most of the shops they passed were boarded up and the few remaining open for business seemed to Paolo to concentrate on ways to transform goods into money. Pawnbrokers, gold for cash, payday cheque converters. It appeared as though all the dregs of the financial service industry had found their way into this street. This time when he glanced up, Paolo saw the flats above the shops were likewise either boarded up or had dirty nets hiding whatever was going on up there. 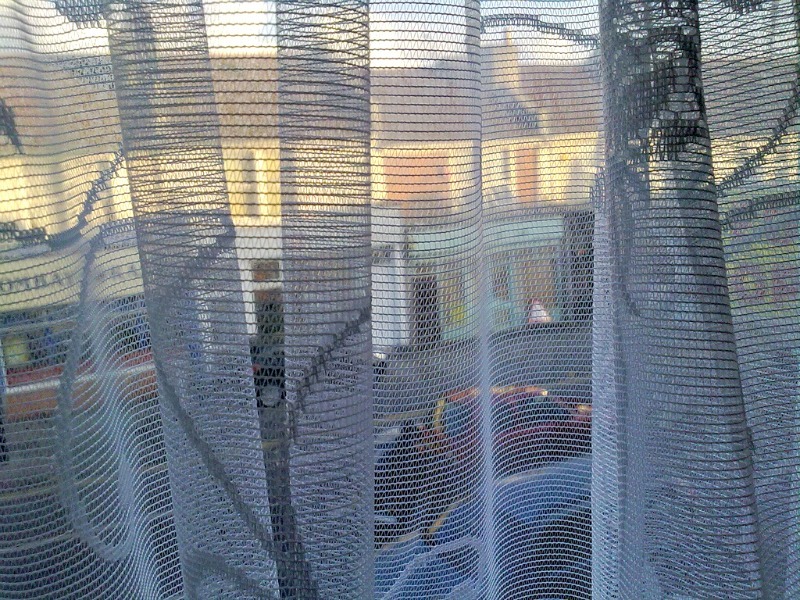 The quality of the net curtains tells you where you are in Bradchester. Photo credit: Joss Smithson via Flickr (CC BY-SA 2.0). I prefer to use places I’ve lived in, or visited many times. I like to know the area and people so well I can conjure them up at will when I’m writing. Barbara Kingsolver and Donna Tartt spring to mind. With both authors I feel as if I am living in the locations depicted. In Donna Tartt’s The Goldfinch she manages to recreate both city and desert locations to the extent one can almost feel the weather. Kingsolver’s The Poisonwood Bible brings the 1959 Belgian Congo to life so powerfully the reader is swept into the villages, fearful alike of jungle creatures and the inhospitable landscape. 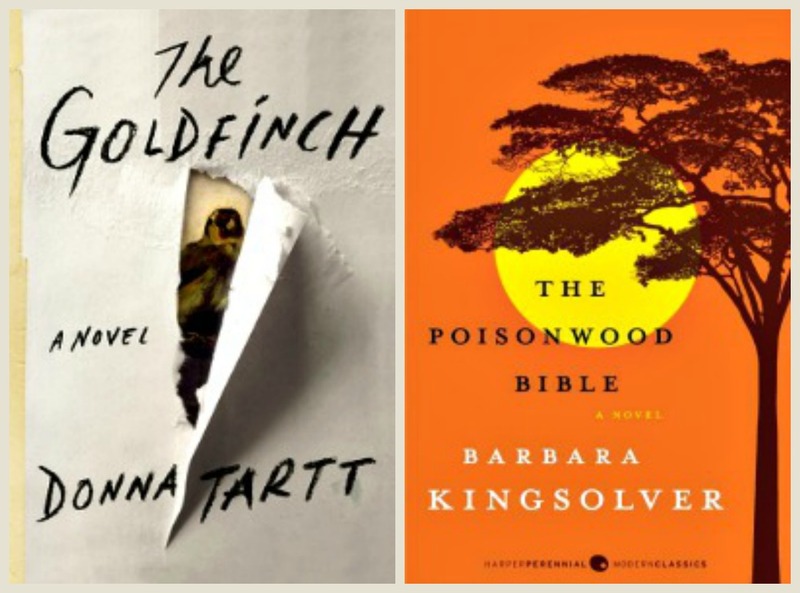 Books that get “place” right: The Goldfinch, by Donna Tartt; and The Poisonwood Bible, by Barbara Kingsolver. Thanks so much, Lorraine! I’m impressed that you created your own place for your crime series novels, and that it’s in the UK, where you haven’t lived for quite some time. Readers, any words of welcome and/or questions for our new columnist? Please leave them in the comments below. And don’t forget to leave a comment on her predecessor, JJ Marsh’s last post for a chance to win 7 e-books that should take you through the summer. All you have to do is answer the question, in 50 words or less: Where and when in the world would you like to go, and why? 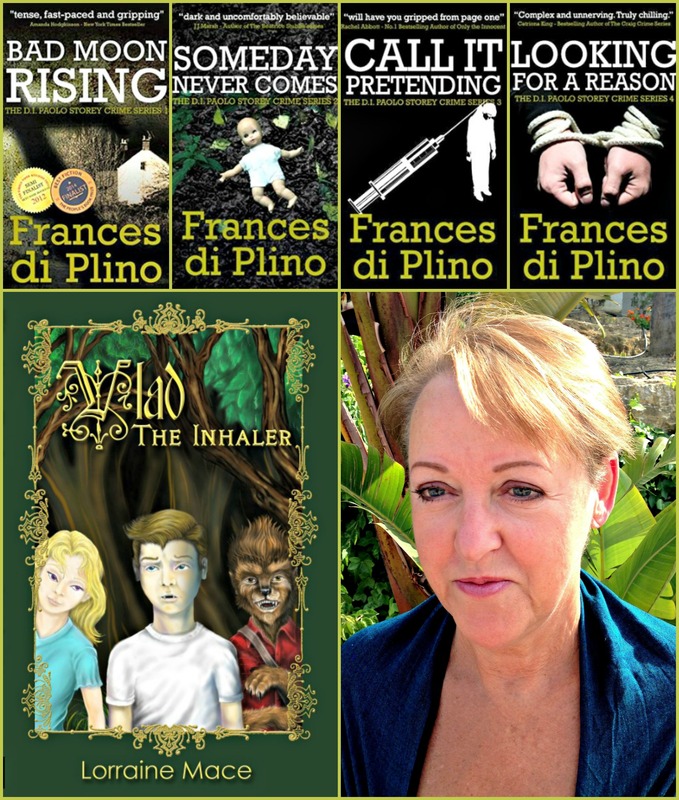 Discover Crooked Cat author, Frances di Plino, and her real-life persona, Lorraine Mace, now a new columnist with The Displaced Nation! Today, she chats about location. Thank you for reblogging and commenting. There’s going to be more Vlad! Yay to that! Great post, Lo! Thank you for reblogging – glad you enjoyed reading the piece. Great post, Lorraine! And having read the Frances di Plino crime series, Bradchester feels like a very real (and rather dangerous) place. Look forward to reading next month’s post. Thank you, Jill. I’ll always think of this as your column and will do my best to fill it with interesting interviewees. Great post, Lorraine. I really enjoy your writing and your advice is always spot on. Off to look at the world through my charcater’s eyes this morning! Thanks for dropping by, Karen.